Last week I realized that I'd never before made a basic banana bread. I would often start with a basic recipe, and then go to town on it, adding oats, nuts, shredded coconut, different flours, chocolate, etc. They were all delicious, and never once have I been disappointed (banana bread, I've discovered, is pretty hard to mess up). Perhaps it's a result of the weeks of craziness that we just came through, but this time, all I was craving was something simple. 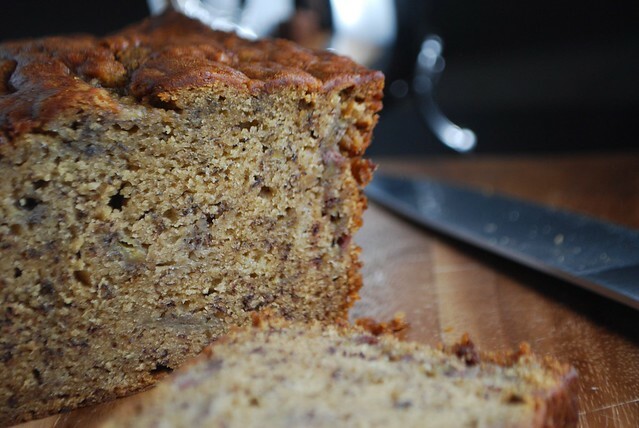 I wanted a classic banana bread without a lot of fuss. That just-perfectly-sweet kind that's perfect for breakfast or an afternoon snack, or maybe even as a substitute for dinner on a lazy weekend evening. I wanted something a little dense, with a lot of bananas in the batter, and just a hint of spice. And while I admit that it took all my will power to back away from the chocolate chips and keep the recipe as simple as possible, in the end I was more than pleased with the results. 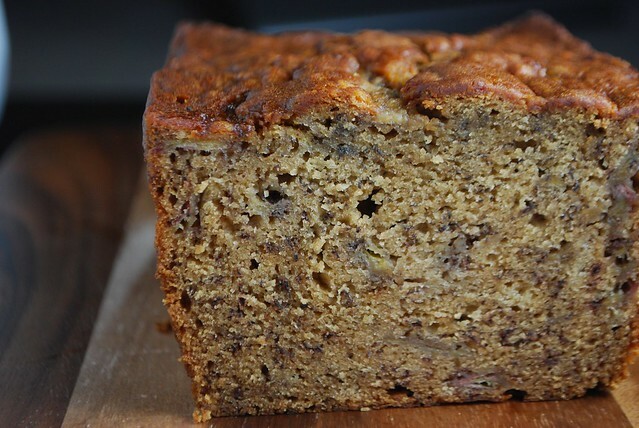 This recipe uses up nearly an entire bunch of bananas, and makes enough for two standard size loaves. I actually made mine in one large and two mini pans so that I could freeze the mini loaves to enjoy later. It come out of the oven golden brown with just a tiny, crackly lump at the top (I had to resist from just pulling it off!). The inside is dark and marbled with the natural fibers and textures of the banana. Mashing the bananas coarsely assures that you'll get little pockets of creamy fruit with every bite. 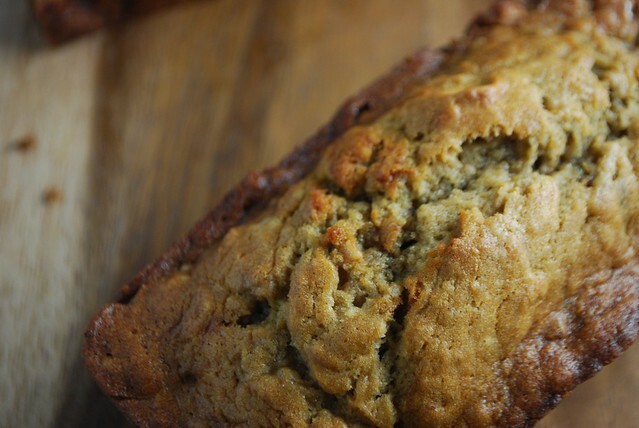 It goes without saying that if you really want to play around with it, this is definitely a perfect classic banana bread recipe to riff on, but I urge you to just try it this way...at least once. When you're working with something as delicious as a banana, there really is something to be said for expressing just a little bit of restraint and letting the banana be the star. Preheat your oven to 350 degrees. Grease and flour two 4x8" loaf pans, set aside. In a large bowl, whisk together the bananas, melted butter, white and brown sugar, eggs, and vanilla extract until fully combined. In a separate bowl, whisk together the flour, salt, allspice, cinnamon, and baking soda. Add the dry ingredients into the banana mixture and mix in gently until thoroughly combined. Pour into prepared loaf pans and bake for approximately 50 minutes to an hour, or until the top is golden and a toothpick inserted in the center comes out clean. Remove from baking pan and let cool completely on a rack. Serve immediately or store for up to one week in an air-tight container.